The program operates conveniently from a toolbar which sits quietly on your desktop in collapsed mode until you need it. 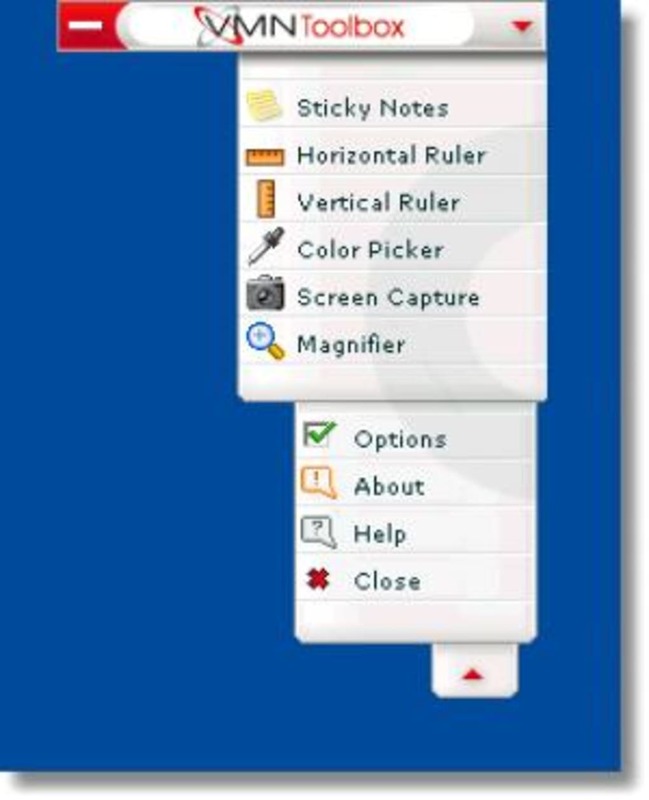 Principally, these tools are a screen capture tool, a post-it note utility, colour picker, magnifier and a virtual ruler. The screen capture tool is fairly simple allowing you to cut and paste images to your clipboard or save them to your hard drive. It is rather limited though when it comes to editing, resizing etc. The quick sticky notes tools removes the need to keep creating paper notes that can be easily lost. Again, it allows for simple writing and editing of notes but there's no reminder function or anything like that. The eye dropper allows you to select on any colour on your screen and replicate it exactly in other imaging applications. The palette allows you to choose from a 16-color, 65,000-color or web-safe palette and the colours can be managed in RGB or Hex format. Meanwhile the magnifier tool allows you to see all the details of any area of your screen in increments of 2x, 4x, 8x, and even 10x. it's a useful tool for those that have trouble reading web pages or graphic designers that need to ensure their images are exactly right. Finally, the virtual ruler allows for measuring of your screen, images or documents for pixel size - again, this is probably only useful for those involved in web design or that have to regularly upload images of a certain size. This is an excellent set of tools that while not particularly advanced, are ideal for someone who needs some basic image management tools. Screen Capture Tool: Capture anything on your screen in a snap. Sticky Notes Tool: Place sticky notes anywhere on your desktop. Color Picker Tool: Capture a fancy color on your screen. Magnifier Tool: Just select your magnification at 2x, 4x, 8x, and even 10x. Virtual Rulers: measure anything on your screen. its not working well with window 10 . I have to install it every time I want to use it. What do you think about VMN Toolbox? Do you recommend it? Why?